Prepared on behalf of a local community group, the brief was to produce restoration proposals for a stretch of neglected urban waterway. Johns Associates designed and prepared a comprehensive restoration masterplan in order to facilitate the coordination of future projects within the scheme, as well as forming a tool to secure additional external funding. 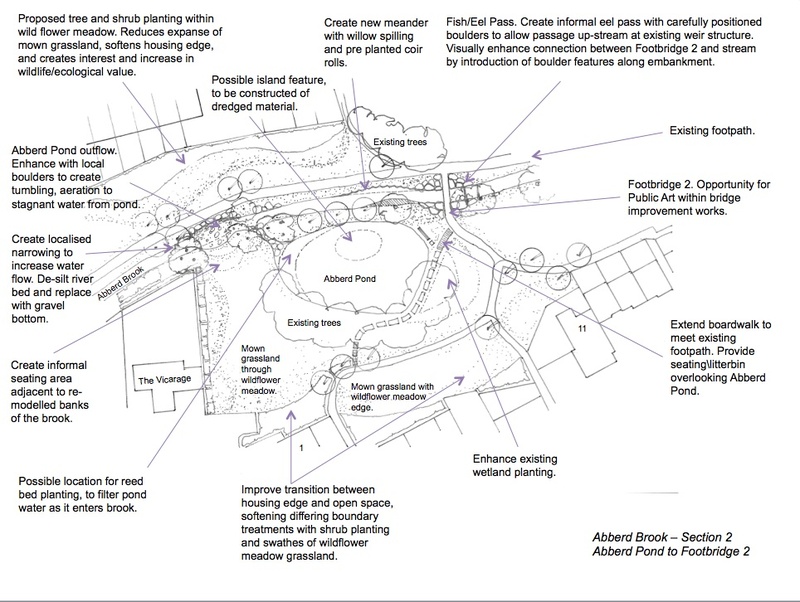 The scheme involved members of Johns Associate’s landscape, ecology, hydrology and planning teams. The restoration proposals aimed to breathe new life and interest into the watercourse and its corridor, to encourage community involvement, and to inspire social responsibility. Habitat improvements including protection of the existing water vole population. Improvements to community facilities, formation of seating areas, provision of play features, outdoor fitness/activity trail, nature trail and art installations. The final documents were presented to the community group to put forward as part of an application for planning permission. Johns Associates presented the proposals at a public consultation exercise at the Town Council forward planning meeting, and as part of a community engagement exercise where they have been vital in gauging support for the project prior to the development of detailed plans for submission for planning permission.